This project is my personal build, and wasn’t for any sponsor, or by any request. So… i started out with the good ol’ damaged gold rush. Stripped her down to her undies. Started by re-spraying the panels. Time to start with the insides, and thy loop! a hot knife to my case…because… Why not ? Phew, that was much needed. And i give you… A star Wars theme’d something something dark side. 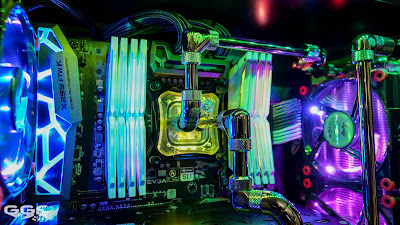 TeamGroup T-Force Delta RGB DDR4 gaming ram. And of course Cablemod full psu custom cables. All of that was accomplished within 48 hours, and it was a much needed to step moving forward. Super happy with the results. Decided to take this further, and go balls to the wall. First, i cut up the original front panel, styled it up to match the system.Boom! Then… i thought.. needs logos. i then thought… you know what… still not spaceshippy.. it needs engines. I’ve also decided to continue this one, until perfect, for the CM world series 2018.